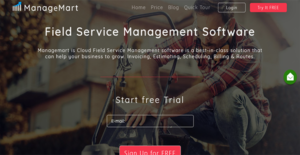 ManageMart is a best-in-class field service management application that provides robust features for optimal operations. It has advanced planning and scheduling tools that allow you to arrange services systematically, so you can accommodate all clients without double booking. You can use those functions alongside the mapping and routing features too. With this combination, your crew can get to their destination at the appointed time, for them to finish all their assigned jobs within the day. With ManageMart, you also have the ability to create payment plans while making certain your clients pay their invoices promptly. That is because the software has an in-built messaging service that sends reminders to customers. Other than that, the solution integrates with QuickBooks to help you better manage your finances. Furthermore, ManageMart has a host of reporting functionalities. The information you gain from the reports it generates can help you improve your services and maintain a healthy bottom line. SMS, calls, and emails are not the only methods available for communicating with clients. ManageMart has a built-in communication system that allows you to send quick reminders to your clients, manage billing, and deliver important scheduling information. You can even configure for recurring SMS, so you can save time from sending regular reminders. Managing a business is the job of a whole team. That is why ManageMart supports the simultaneous use of the application by numerous users. However, you do not have to fear about breach of data integrity as the software automatically collects employee activity data. As such, you can make certain that no suspicious or fraudulent activities occur. ManageMart provides you with innovative mapping and routing technologies that allow your field personnel to find the most suitable directions. With this, they can get to their destination on time or even before the arranged hour so they can complete all their set tasks for the day to avoid scheduling problems. With ManageMart, you can maximize assets to optimize your operations and reduce costs at the same time. One way it can help in that regard is by affording you the ability to manage equipment and workforce remotely. For the former, you can ensure that they are well maintained for highest working potential and for the latter, you can make certain that they efficient and productive on company hours. ManageMart has a seamless integration with QuickBooks that sends financial information to the accounting software smoothly. Every detail regarding the inflow and outflow of cash to and from the company is taken note of by the system to account for every cent. Additionally, the software can connect with Square, PayPal, and Stripe to record financial movements that do not occur physically for you to have full visibility of your finances. Creating a cohesive schedule is essential to running a smooth business, especially one with field operations. ManageMart aids you in ensuring that every task indicated on the calendar is finished on time to increase your company’s profitability. This can also delight your customers and possibly lead them to tell their friends about your services. Thus, you can expand your operations with the help of your existing clients. What Problems Will ManageMart Solve? Scheduled services can still be on time despite problems on the road with the help of ManageMart. Mobile crews can use the application to find the most feasible route to help them get to their destination punctually. Additionally, as the application takes into account the size of the vehicle, the weather, and the traffic jam, field workers can avoid delays and still stay on schedule. Businesses can continue serving all customers without running into scheduling troubles. ManageMart can help them create plans and schedules that allow them to accommodate every client while avoiding double booking. The system even automatically adjusts the calendar and notifies users of any changes. This way, companies can take care of the satisfaction of their clients and grow. Keeping a business afloat is a challenge. ManageMart can assist company owners in ensuring that customers pay them for their services rendered on time. It also affords owners the ability to arrange payment plans with customers to the satisfaction of the parties involved. Aside from that, the system can relay financial information to QuickBooks to enable smoother financial management. Each organization has different wants and requires a software that can be personalized for their size, type of employees and buyers, and the particular industry they are in. For these reasons, no software can proffer perfect functionality off-the-shelf. When you look for a software app, first be sure what you need it for. Read some ManageMart reviews and ask yourself do you want basic features or do you need sophisticated features? Are there any industry-specific tools that you are looking for? Get the answers to these questions to assist your search. There are multiple elements that you need to mull over and these include your finances, particular business needs, your company size, integration requirements etc. Take your time, try out a few free trials, and finally choose the platform that presents all that you require to enhance your firm effectiveness and productivity. How Much Does ManageMart Cost? We realize that when you make a decision to buy Field Service Management Software - FSM it’s important not only to see how experts evaluate it in their reviews, but also to find out if the real people and companies that buy it are actually satisfied with the product. That’s why we’ve created our behavior-based Customer Satisfaction Algorithm™ that gathers customer reviews, comments and ManageMart reviews across a wide range of social media sites. The data is then presented in an easy to digest form showing how many people had positive and negative experience with ManageMart. With that information at hand you should be equipped to make an informed buying decision that you won’t regret. What are ManageMart pricing details? What integrations are available for ManageMart? If you need more information about ManageMart or you simply have a question let us know what you need and we’ll forward your request directly to the vendor.